If snowmen are my favourite Christmastime characters, then gingerbread men are a very close second. They look cute and smell wonderful, and dare I say it, they taste even better! 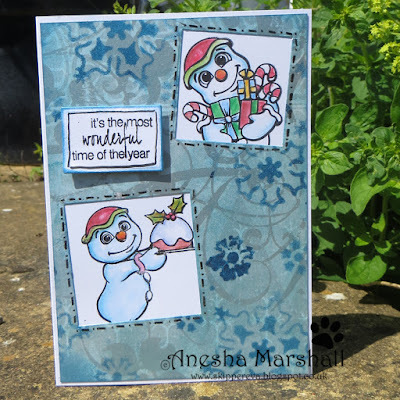 This new set contains three gingerbread characters and five coordinating sentiments. Shipping is free to Australia and New Zealand, and just $2.00AU to anywhere else in the world. My designers have created some wonderful projects with this new set. Check out the different ways they have interpreted the images, the colouring and techniques are fabulous! Those quirky little guys a re so cute! Great designs by the team. Lots of sweet treats in this set! I love these little fellas! Especially when they wear such cute pajamas! SO CUTE and SNOW CUTE! FABULOUS images and FUN sentiments, WONDERFUL cards to INSPIRE! Such a cute set...since I have been to America in Christmas time, I so love gingerbread men...in the Netherlands they are rather unknown. Your DT made fab cards with them. So sute, love the paperpiecing! Oh, what an adorable set, Beccy. Love the cards your team did, especially the ones which are paper pieced! Is it just me or do you also get hungry when you see these stamps? The set is gorgeous and I love the cards from the team. Thanks for the inspiration. Very, very cute! I am obsessed with gingies this year! I think this one will be a big seller! The PJ's crack me up! Super!